some kids are smarter than you. Some kids have cooler clothes than you. Some kids are better at sports than you. It doesn't matter. You have you thing too. Be the kid who can get along. Be the kid who is generous. Be the kid who is happy for other people. be the kid who does the right thing. 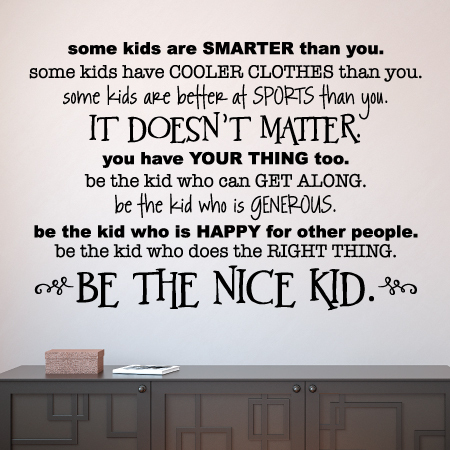 be the nice kid. >> A strong message for any classroom, school, play room, or daycare. A fun and stylish reminder that being you is just who you are meant to be and being nice is more important than anything else.